Passing through a long, elegant gallery at the Carnegie Museum of Art in Pittsburgh, its walls lined with masterpieces of nineteenth century European Impressionism, you come to a small dimly lit chamber. Peering out from within the darkness, your gaze is fixed by a pair of ivory white eyes. They draw you into the gloomy recess, where you are confronted by a fearsome figure; his right arm held above him ready to attack, his wide-mouthed scowl revealing two chipped and jagged teeth. You recoil briefly before realizing that all is safe: the brute is trapped within a Perspex case, and on further inspection you find that he is weighed down with a messy assortment of slings and arrows that pierce his body, a mélange of rusted nails sticking out in every direction. [Fig.1]. The figure is a nkisi (plural minkisi) of the type known as nkondi (plural minkondi) from the Congo basin in west central Africa. Nkisi is a general term referring to spirits and the objects that house them. 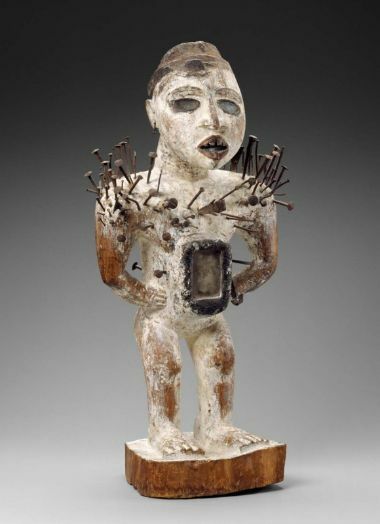 Nkondi refers more specifically to the category of objects once referred to as nail fetishes but now more diplomatically called power figures. Although the precise practices varied over time and place, nkisi nkondi were generally produced by nganga (ritual specialists), who would work in conjunction with a supplicant or a separate artisan. 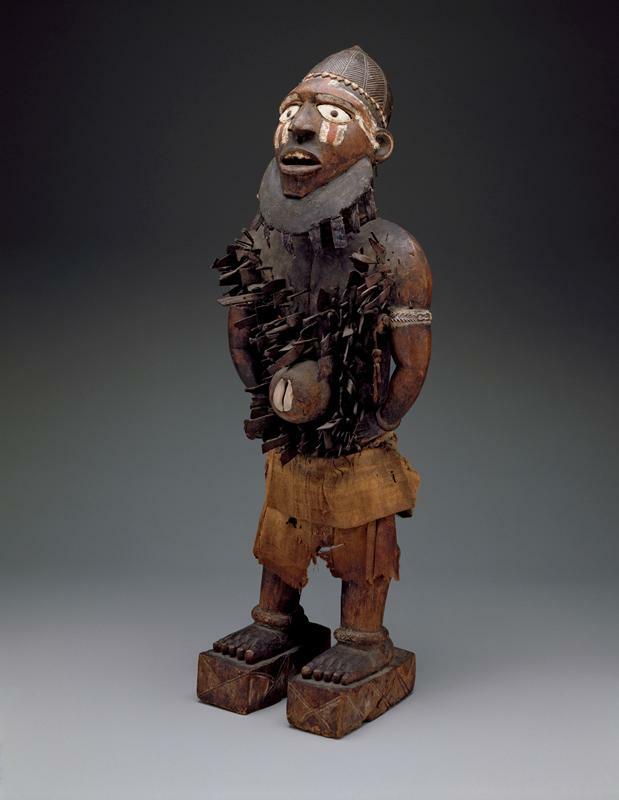 The carved figure (usually humanoid, but occasionally taking the form of an animal such as a dog or panther) would act as a container, which would be animated and empowered by the insertion of a parcel of medicine (bilongo). In the case of the Carnegie Museum nkisi, this parcel would have been sealed into the now empty cavity on the figure’s belly. Once animated by the nganga, supplicants would drive nails and other objects into the nkisi in order to enrage the spirit into action for the purposes of vengeance, protection, healing, or dispute resolution. In other instances, minkondi could be used to sanction an oath; if the oath were broken, the spirit would be released to hunt down the party that breached the agreement. Reflecting this function, nkisi nkondi are often depicted in the pose of hunters, and the word nkondi is derived from the word konda meaning “to hunt.” The Carnegie Museum nkisi is a fine illustration of this, and it is likely that its raised hand would have originally held a knife or spear. The nkisi in the Carnegie Museum is a striking object, but one of a kind that can be found in museums across America and Europe. The Metropolitan Museum of Art, New York, the Museum of Fine Arts, Boston and the Art Institute of Chicago all house impressive examples of minkondi. But is it appropriate to exhibit these objects in the context of a western art museum? On the one hand, they appear incommensurate with the western concept of art: they are functional objects whose efficacy was measured in ritual/magical terms and not aesthetic criteria; they were never intended as objects of autonomous aesthetic contemplation; moreover, they were often produced communally, bearing the scars of their shared use. Is it an act of interpretive violence to include these objects in a museum, where they are largely stripped of their context and become admired for their aesthetic impact or formal effect? Perhaps unsurprisingly, due to both their ubiquity in western museums and the conceptual challenges they pose, nkisi nkondi are frequently cited by those trying to grapple with the most basic questions of the anthropology of art. Is art a universal category? Is it possible, practical, or even ethical to consider aesthetics cross-culturally? What kind of theoretical category could possibly embrace minkondi alongside a portrait by Gainsborough, an Islamic girih mosaic or a Brillo Box by Andy Warhol? These types of questions gained a degree of urgency in the wake of post-colonialism, when the hierarchies of western vision came under scrutiny across all disciplines of the humanities. As western conceptual artists sought to push the boundaries of what constituted art (a performance? a text? a urinal? ), art historians and anthropologists drew attention to the fact that, not only was the category of “primitive art” a western creation designed to enforce hierarchical cultural distinctions, but the entire notion of aesthetic autonomy was a western epistemological eccentricity. While such critiques were often overshadowed by the vehemence of their righteous indignation (and their tendency to homogenize western cultural attitudes), their basic premise was a valuable one: categorical distinctions such as “primitive art” and “fine art” were created and perpetuated by a social context designed to exalt western cultural achievements, while denigrating the art of non-western cultures as conceptually or formally inferior, positioning it on a lower rung of the evolutionary ladder, while denying its coevality by placing the supposedly non-modern “primitive” in a less developed temporal frame. This paper considers minkondi within the context of these debates. In particular, it focuses on two contrasting theories of art, developed by Howard Morphy and Alfred Gell in an attempt to create a methodological framework for the interpretation and appreciation of art objects. Minkondi present several grounds for disputing the hegemony of the western category of art. Far from being the relics of a primeval past, most minkondi housed in American and European museums are intrinsically linked to the forces of modernity. 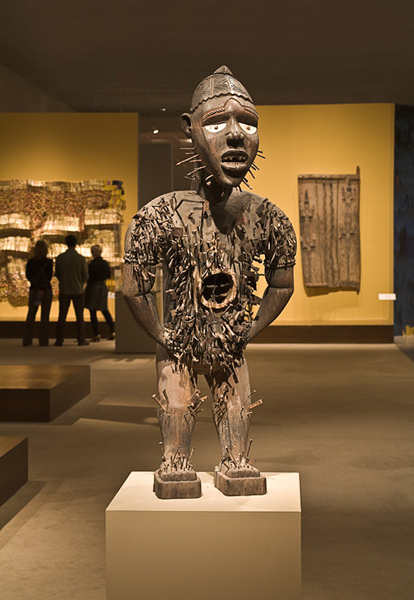 Like the Carnegie Museum example, most of these were created between 1875 and 1825; the period when the ethnographic “scramble” for African art began in earnest. As Enid Schildkrout and Curtis Keim note, cultural objects from the Congo had been making their way to Europe since the arrival of the Portuguese in the fifteenth century, but it was in the late nineteenth century as scientific and ethnographic theories of evolution created a new interest in “primitive” cultures that such objects began to be systematically acquired in significant volume. Spurred by the emergence of orthogenetic theories of evolution, ethnographers clambered to collect these supposed relics of authentic primitive cultures for the information they could shed on the development of humanity. However, far from proving these spurious teleological theories of cultural development, minkondi point to more complex processes of cultural transaction and exchange. For although Zdenka Volavkova finds historical record of the creation and use of minkondi dating back to 1676, and Wyatt MacGaffey and John Janzen suggest that the practice could have been current a century earlier, Kasja Ekholm Friedman shows that there is significant reason to believe that the usage of these objects developed as a modern response to the changing social and cultural circumstances created by colonialism. While Friedman recognizes that the practice of nkisi nkondi was undoubtedly present before colonization, she argues that it played a relatively minor role alongside practices of ancestor worship and other religious observances. The flourishing of minkisi cults of the late nineteenth century was due to a combination of factors, including the spread of new diseases, the destruction of traditional authority structures in which Earth Gods and Kings were expected to intercede between subjects and the spirit realm, and the arrival of Christian theology which encouraged individual communication with God. Thus, according to Friedman, the rise in fetishism should be seen as “a product of dissolution and crisis.”  While critics of “primitivism” often put questions of representation on a temporal structure, Friedman’s conclusion suggests that fetish objects are a modern phenomenon and a response to the conditions of (an albeit alternative) modernity. As Jean and John Comaroff affirm, practices such as witchcraft and fetishism are integral to the experience of the contemporary world. They should not be seen as a return to pre-modern, irrational forms, but as part of a dynamic modernity constructed through the processes of globalization. In such a context, minkondi can be seen as a hybrid cultural form, forged through exchange and coalescence. If, in this sense, minkondi test the limits of our Eurocentric conception of modernity, they pose a similar challenge to the western category of art. It is not that minkondi are incommensurate with western art objects, but rather, it is their similarities that draw attention to the antinomies within such categorical distinctions. As Wyatt MacGaffey wryly observes, “Magic has been regarded as a bizarre phenomenon, the artness of art has not.” Noting the rampant commodity fetishism inherent in the art market, along with the hushed reverence and quasi-religious status accorded artworks as the “embodiments of spiritual value,” MacGaffey concludes that, “the Kongo attitude towards fetishes is not all that different from the gallery-goer’s attitude to art.” It is, perhaps, possible to take this argument even further, as Rachel Moore does in her study of modern cinema, in which she argues that the dual concepts of magic and the primitive were invoked by modern film-makers in order to overcome the disavowal of sensuous resonance that had made the connection between sign and signifier seem arbitrary and conventional in modern language. For Moore, modern cinema works precisely as a fetish, reconnecting sign practice with the physical act of expressive transaction. It is noteworthy that this concept of magic corresponds almost precisely to the definition of art offered in R.G. Collingwood’s famous treatise The Principles of Art published in 1938. Nothing is decidable in advance about the nature of [the art] object, because the theory is premised on the idea that the nature of the art object is a function of the social-relational matrix to which it is embedded. It has no ‘intrinsic’ nature, independent of the relational context. This line of thinking could easily be confused with the pure relativism of an institutional theory of art as theorized by Arthur Danto, in which art is defined as whatever is treated as art by the institutionally recognized art world. Gell is quick to refute such a claim, proposing instead that it was possible to consider art as a special form of technology, defined by the role it plays in advancing social relationships constructed through agency: “I view art as a system of action intended to change the world, rather than encode symbolic propositions about it.” For Gell, the art object is a mediating object in human actions: “the anthropology of art, to reiterate, is just anthropology itself, except that it deals with those situations in which there is an ‘index of agency’ which is normally some kind of artifact.” These create “art like situations” – which, he argues can normally be recognized intuitively – in which the material index permits the abduction of specifically social agency. Gell’s theory provides a useful starting point to move beyond western assumptions about art and aesthetics. His desire to sidestep the symbolic and aesthetic elements of art is driven by the recognition that such analysis can only ever start from a position informed by western assumptions. As Robert Layton notes, Gell does not deny that works of art often contain an aesthetic dimension, but is conscious that the “aesthetic attitude” is a specific historic product of western epistemology. However, as Layton and other critics have been quick to point out, by focusing on social action over signification Gell ignores the ways in which aesthetic and semantic elements contribute to the efficacy of this social action. This criticism is been leveled with particular force by Howard Morphy for whom these elements are central to the definition of art. For Morphy, “art objects are ones with aesthetic and/or semantic attributes (but in most cases both), that are used for presentational purposes.” In simple terms, the difference between Gell and Morphy’s theories might be seen as a matter of focus: whereas Gell’s interest is in assessing what art does, (ie. what makes an art-like situation) for Morphy, it is the how question that is paramount. The anthropology of art, he argues, “must engage with the study of form at the micro level, seeing in the production of art objects a form of agency that arises from bodies of knowledge.” To ignore these elements, equates to a failure to account for the role of human agency in artistic production and the precise ways in which art operates as a mode of action. Gell cites land mines as agents of the evil intent in the minds of Pol Pot’s soldiers. Pol Pot’s soldiers used them as extensions of their own agency. This is a misleading parallel. Art objects do not have the same kind of agency as mantraps or poisoned arrows. If Pol Pot’s soldiers had spent their time burying pictures of the Mona Lisa, or even pictures of Pol Pot, there would not be so many Cambodians whose lives today have been ruined by shattered limbs. Certainly, Gell’s theory seems excessively broad, and yet, even with Morphy’s caveats, the question of theorizing the agency of matter – or more specifically, the intersection of human and material agency – remains a vexing problem for both Moprhy and Gell. Indeed, it is worth noting the affinities between Gell and Morphy’s theorizing of art and Nicole Boivan’s more general attempt to negotiate the relationship between the material and cognitive worlds. While Boivan is far less interested in the kind of categorical distinctions that occupy Gell and Morphy, her conclusions on the interconnection of the material and mental worlds end up looking remarkably similar. Mediation is always a component of material cultural object but the mediating role is fundamental to art objects. They mediate between domains of existence, they mediate between artist and audience, and they mediate between an object that they are an index of and the person interacting with the object. Index of cumulative agency, a visible knot tying together an invisible skein of spatio-temporal relations of which the participants in the ritual are well aware … Minkisi are always ensembles of materials signifying, by there names, their appearance or their associations, the powers attributed to the whole. According to MacGaffey, the effect of the nkisi nkondi is a result of the complex interplay between concealment and accumulation of meaning: “containment gives the impression that something may be hidden inside, and accumulation adds obscurity to make the secret evident.” Essential to this “cognitive stickiness” however, is the art object itself, and MacGaffey notes that the sense of interiority and mystery were often heightened by impressive workmanship. Finely created minkisi were intended to arouse astonishment (ngiukulu), and it was widely held that sculptures admired for their art made more effective minkisi. MacGaffey uses this to illustrate Gell’s theory of enchantment, through which works of formal complexity or technical virtuosity exert a power of fascination upon the viewer because the viewer is trapped in the indecipherability of the index. However, to return to Morphy’s “how” question, Gell’s theory falls short of identifying the particular properties of objects that trigger these feelings of enchantment. In one of the least satisfying sections of Art and Agency, while discussing complex patterns, Gell hints at the possibility that complex patterns might act something like a picture of agent-patient relationships. In an abstract picture one patch of colour seems to be ‘pushing against’ another patch of colour, even though there are no objects in the external world with which we can identify these patches of colour. The causal interaction we perceive is internal to the index itself … the parts of the index exert causal influence over one another and testify to the agency of the index as a whole. In doing so, Gell offers the possibility that aesthetics work something like a structural analogue to agent-patient relations. By extension, this argument could be used to claim that the most charged objects of social agency are necessarily the most aesthetically charged, as they present a visual embodiment of this relationship. Such a conclusion would, however, vindicate Morphy’s call for the study of form at a micro level, and run counter to Gell’s central claim that art can be understood as a force of social agency entirely independently of aesthetic criteria. This difficulty reveals an intractable tension in Gell’s work between culture as process, and cultures as bounded groups. These are necessarily overlapping categories to which art is both a social agent and binding force, as well as essential mode of self-representation. As Marsha Meskimmon posits: “I would argue that art is a vital form of articulation, that visualization and materialization are active and forceful modes in the production of the real, and that they can transcend the limits of current understanding by pushing the boundaries of imagination.” If, for Morphy, close formal reading reveals the agency that arises from a body of knowledge, the indeterminacy of art also allows for subtle expressions of cultural change, where hybridity and transaction allows for new forms of cultural expression. Having established nkisi nkondi as the representative objects of an alternative modernity, perhaps the next question that must be asked is whether and in which ways their forms have been altered in the traffic in culture, and how they might be able to speak cross-culturally of our shared experience of globalization. Such questions reveal the indivisibility of the social and the cultural, and the arbitrariness of drawing distinctions between the aesthetic and social action of art. As Bart Vandenabeele notes, artworks “are human artifacts that cannot be understood at all separate from human values, intentions, interests, or habits. That is why they are not unchangeable: they are being constantly changed by and adapted to the human ways of life or communities that are equally temporary, historical and continually transforming.” Likewise, as Gell notes, art objects are not solipsistic, but rather, they are collaborative, involving audiences and other artists: “art objects are not self-sufficient, but human agency is exercised within the material world.” His words echo Collingwood’s declaration that “the artist stands in collaborative relations with an entire community.” Roy Sieber and Roslyn Walker stress the importance of collaboration in the creation of minkondi and their integration into the practices of everyday life in the Congo. 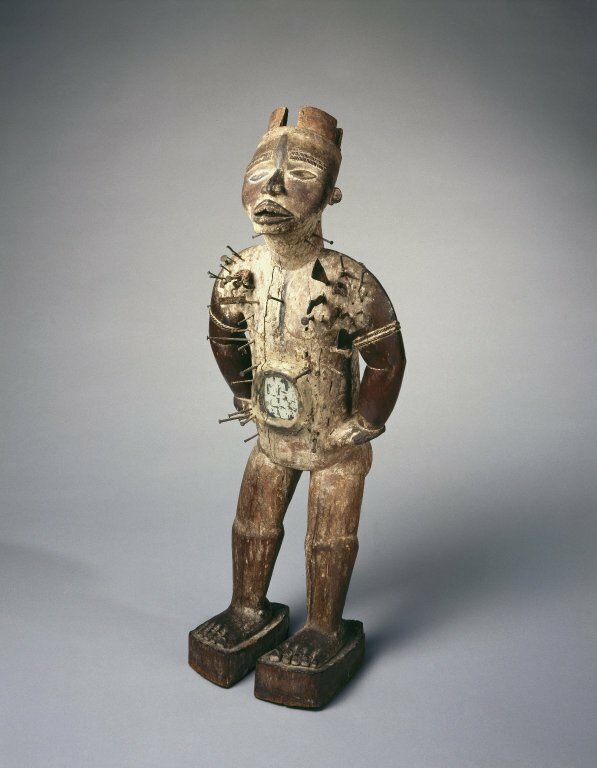 However, this interconnection between art and life is not unique to the Congo, it should be seen as a vital component to understanding the category of art. A good collector (as opposed to the obsessive, the miser) is tasteful and reflective. Accumulation unfolds in a pedagogical, edifying manner. The collection itself – its taxonomic, aesthetic structure – is valued, and any private fixation on single objects is negatively marked as fetishism. According to Clifford, all identities are based around accumulation, but only western identity is obsessed with the collection of possessions. This, he argues, is a peculiarly western strategy for the development of a possessive self. At the same time, it reveals the underlying iconoclasm the W.T.J Mitchell argues motivates the profound discontinuity between image and reality (signifier and signified) that propels the western drive for aesthetic autonomy. For successful (artistic) communication, it is not a necessary requirement that words, images, sounds, and concepts have exact meanings shared by all participants … incommensurability between languages and concepts could be interpreted in a positive way, that is, the communication process is kept in motion by what the participants do not share. These are the kind of cross-cultural “conversations” that Anthony Appiah suggests lead to imaginative engagement with the Other, an engagement, that in Collingwood’s words becomes “progressively stronger as conversation proceeds, and based on the fact that neither party seems to the other to be talking nonsense.” It is through encounters like these that identity is extended: a perfect illustration being the profound influence of non-western arts, first through “primitivism” and later in the challenges of post-colonialism. The exposure to works like the nkisi nkondi first changed western art, and then our understandings of what constituted the category of art. That we continue to ask these questions, and that their answers remain illusive — just as they do to erudite scholars like Morphy and Gell — suggests that the question “what is art?” may itself be charged with a certain cognitive stickiness whose very indecipherability lends this conversation such power. Wyatt MacGaffey, “‘Magic, or as we Usually Say, Art’: A Framework for Comparing European and African Art,” in The Scramble for Art in Central Africa, eds. Enid Schildkrout and Curtis A. Keim (Cambridge: Cambridge University Press, 1998), 228-229. 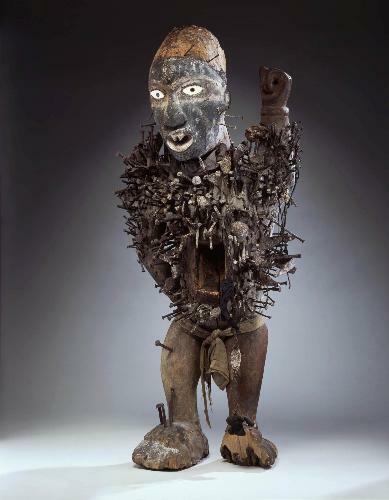 See for instance, Zdenka Volavkova, “Nkisi Figures of the Lower Congo,” African Arts 2 (Winter 1972): 52, Wyatt MacGaffey and John Janzen, “Nkisi Figures of the Bakongo,” African Arts 7 (Spring 1974): 88 and Wyatt MacGaffey, Art and Healing of the Bakongo (Stockholm: Folkens museum-ethnographiska, 1991), 121. Wyatt MacGaffey, Art and Healing of the Bakongo, 121. See for instance, Alfred Gell, Art and Agency (Oxford: Oxford University Press, 1998), 59-62, Cesare Poppy, “Wonders taken for Signs” in Presence: The Inherence of the Prototype with Images and Other Objects, eds. Robert Maniura and Rupert Shepherd, (London: Ashgate, 2006), 235, Bart Vandenabeele, “‘New’ Media, Art, and Intercultural Communication,” Journal of Aesthetic Education 38:4 (Winter, 2004), 1-2, Robert Farris Thompson, “Kongo Power Figure,” in Perspectives: Angles on African Art (New York: The Centre for African Art, 1987), 180-181, MacGaffey, “‘Magic, or as we Usually Say, Art’: A Framework for Comparing European and African Art,” 230-234, and Wyatt MacGaffey, “Astonishment and Stickiness in Kongo Art: A Theoretical Advance,” RES: Anthropology and Aesthetics 39 (Spring 2001), 137-150. See for instance, James Clifford, The Predicament of Culture (Cambridge, MA: Harvard University Press, 1988), Sally Price, Primitive Art in Civilized Places (Chicago: Chicago University Press, 1989), Shelly Errington, The Death of Authentic Primitive Art and Other Tales of Progress (Berkley: University of California Press, 1998) and Susan Hiller ed. The Myth of Primtivism: Perspectives on Art (London: Routledge, 1991). Howard Morphy and Morgan Perkins, “The Anthropology of Art: A Reflection on its History and Contemporary Practice,” in The Anthropology of Art: A Reader, eds. Howard Morphy and Morgan Perkins (Malden, MA: Blackwell, 2006), 7-8. Johanne Fabian, Time and the Other: How Anthropology Makes its Object (New York: Columbia University Press, 1983). Enid Schildkrout and Curtis A. Keim, “Objects and Agendas: Re-collecting the Congo,” in The Scramble for Art in Central Africa, eds. Enid Schildkrout and Curtis A. Keim (Cambridge: Cambridge University Press, 1998), 21-25. 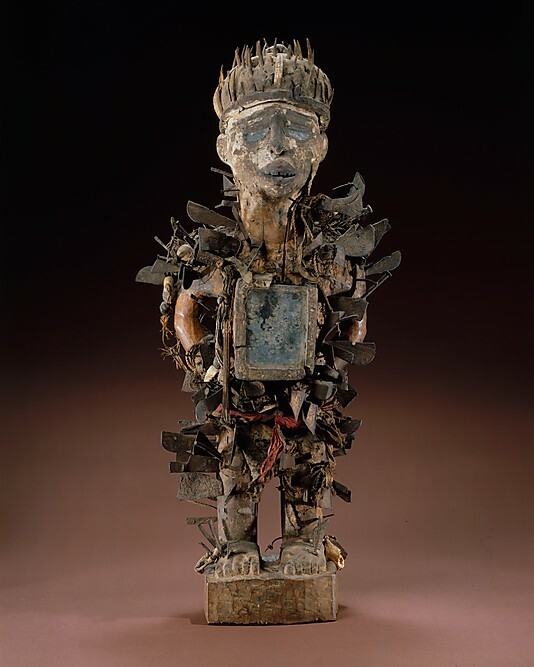 Enid Schildkrout and Curtis A. Keim, “Objects and Agendas: Re-collecting the Congo,” 21-25. Zdenka Volavkova, “Nkisi Figures of the Lower Congo,” African Arts 2 (Winter 1972): 52. Wyatt MacGaffey and John Janzen, “Nkisi Figures of the Bakongo,” African Arts 7 (Spring 1974): 88. It is worth noting that MacGaffey and Janzen draw on the same historical source as Volavkova in making this claim (Olfred Dapper’s 1670 account of his travels in Africa), but come to different conclusions as to the historical veracity of some of the claims made in Dapper’s text. Kasja Ekholm Friedman and Jonathan Friedman, Modernities, Class, and the Contradictions of Globalization (Plymouth, UK: AltaMira Press, 2008), 29-85. See also Dunja Hersak, “There are many Kongo Worlds: Particularities of Magico-Religious Beliefs among the Vili and Yombe of Congo-Brazzaville, Africa: Journal of International African Institute, 71 (4: 2001): 614-640. Kasja Ekholm Friedman and Jonathan Friedman, Modernities, Class, and the Contradictions of Globalization, 29-85. Jean Comaroff, Modernity and its Malcontents: Ritual and Power in Post-Colonial Africa, (Chicago: University of Chicago, 1993). MacGaffey, ‘Astonishment and Stickiness in Kongo Art: A Theoretical Advance,” 139. Rachel O. Moore, Savage Theory: Cinema as Modern Magic, (Durham: Duke University Press, 2000). R.G. Collingwood, The Principles of Art, (Oxford: Clarendon Press, 1938). MacGaffey, “‘Magic, or as we Usually Say, Art’: A Framework for Comparing European and African Art,” 230-233. Gell, Art and Agency, 7. Arthur Danto, “The Artworld,” The Journal of Philosophy 61 (19, October 1964): 571-584. Gell, Art and Agency, 5. Gell, Art and Agency, 9-10. Robert Layton, “Art and Agency: A Reassessment,” Journal of the Royal Anthroplogical Institute 9 (2003): 449. See for example, Howard Morphy, “Art as a Mode of Action: Some Problems with Gell’s Art and Agency,” Journal of Material Culture 14 (1): 5-27, Brigitte Derlon and Monique Jeudy-Ballini, “The Theory of Enchantment and the Enchantment of Theory: the Art of Alfred Gell,” Oceania 80 (2, July 2010): 129-142, and Robert Layton, “Art and Agency: A Reassessment,” 447-464. Morphy and Perkins, “The Anthropology of Art: A Reflection on its History and Contemporary Practice,” 12. Morphy, “Art as a Mode of Action: Some Problems with Gell’s Art and Agency,” 6. Morphy and Perkins, “The Anthropology of Art: A Reflection on its History and Contemporary Practice,” 17. Morphy and Perkins, “The Anthropology of Art: A Reflection on its History and Contemporary Practice,” 13. Morphy and Perkins, “The Anthropology of Art: A Reflection on its History and Contemporary Practice,” 12, 15. Layton, “Art and Agency: A Reassessment,” 452. Nicole Boivan, Material Cultures, Material Minds (Cambridge: Cambridge University Press, 2008). It is worth noting that Boivan discusses both Gell and Morphy’s work at some length in her book. Morphy and Perkins, “The Anthropology of Art: A Reflection on its History and Contemporary Practice,” 13-14. Morphy, “Art as a Mode of Action: Some Problems with Gell’s Art and Agency,” 8. Gell, Art and Agency, 22, see also MacGaffey, “Astonishment and Stickiness in Kongo Art: A Theoretical Advance,” 141. Morphy, “Art as a Mode of Action: Some Problems with Gell’s Art and Agency,” 10. Robert Sharf, “The Buddha’s Fingerbones at Famensi and the Art of Chinese Esoteric Buddhism,” The Art Bulletin 93 (1: March 2011), 38-57. Gell, Art and Agency, 20-23. MacGaffey, “Astonishment and Stickiness in Kongo Art: A Theoretical Advance,” 145-146. MacGaffey, “Astonishment and Stickiness in Kongo Art: A Theoretical Advance,” 141. MacGaffey, “Astonishment and Stickiness in Kongo Art: A Theoretical Advance,” 141.Derlon and Jeudy-Ballini, “The Theory of Enchantment and the Enchantment of Theory: the Art of Alfred Gell,” 133-135. Derlon and Jeudy-Ballini, “The Theory of Enchantment and the Enchantment of Theory: the Art of Alfred Gell,” 133-135. Gell, Art and Agency, 76. Morphy, “Art as a Mode of Action: Some Problems with Gell’s Art and Agency,” 22. Marsha Meskinnon, Contemporary Art and the Cosmopolitan Imagination (London: Routledge, 2011), 6. Vandenabeele, “‘New’ Media, Art, and Intercultural Communication,”7. Collingwood, Principles of Art, 324. Roy Sieber and Roslyn Walker, African Art in the Cycle of Life (Washington DC: Smithsonian Institute, 1987). Clifford, The Predicament of Culture, 219. Collingwood, The Principles of Art, 309. Vandenabeele, “‘New’ Media, Art, and Intercultural Communication,” 2.